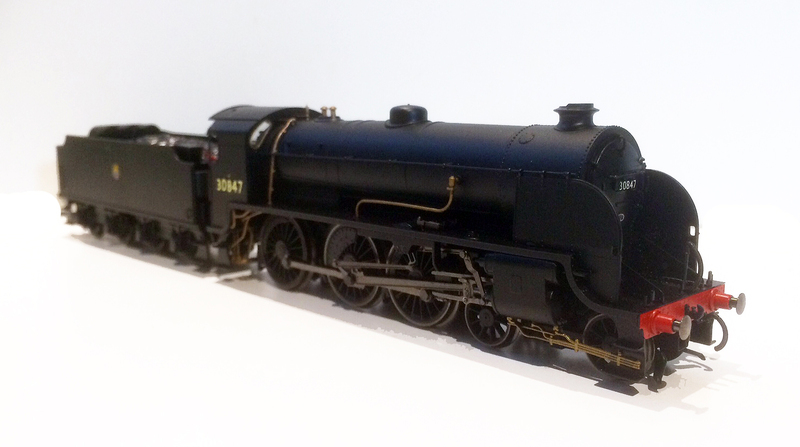 This weekend I finished changing the identity of one of Hornby’s excellent S15 Class 4-6-0 models to represent 30847 one of the locomotives preserved by the Maunsell Locomotive Society. I carried out the work on behalf the Company Secretary of the Society and it was a pleasure to assist him in getting a model of 30847, that has been lovingly restored by members of the Society, and has seen frequent service on the Bluebell Railway. Further details on the actual 847 / 30847 can be found on the Maunsell Locomotive Society’s website here, in addition to 847 they also have U class 2-60’s Nos. 1618 & 1638, Q class 0-6-0 No. 541 and Schools Class V 4-4-0 No. 928. If you are interested in joining and supporting the Society click here. Carrying her new identity as 30847 just prior to the cabsides gaining a coat of satin varnish. The donor locomotive was a Hornby R3328 No. 30843, although I have detailed my method of changing model identities on this site before and I generally followed my usual processes, I detail them again here for reference. In this instance I did not require to repaint the model and for a change I would be giving the locomotive a BR identity. Another view of 30847, the replacement smokebox door number can just be seen. I actually removed the entire number on each cabside rather than just try and change the last digit (as generally the available transfers never quite exactly match the factory applied numbers) using good quality enamel thinners on a cotton bud, this also leaves the are where the numerals have been removed as a shiny surface finish which is good for the application of the replacement transfers. I took care not remove the existing small 6F power classification printing. I then replaced the numbers starting with the centre digit ‘8’ and working outwards on both cabsides, as this I find it easier to keep the numerals level, using HMRS Pressfic transfers sheet 14 BR steam era loco and coach insignia. To seal the number transfers and retrun the cabsides to an ex-factory finish I masked off the model just leaving the cabsides exposed and sprayed with a light coat of Railmatch satin varnish. The smokebox door number plate was changed using transfers from the Fox Transfers FRH4099/003 – Southern Region Smokebox Numbersets 30726-31059 set which simply and neatly covers the existing printed number plate. To complete the identity change I fitted one of the very fine (and small!) etched shed code plates for 72B (Salisbury) also from Fox Transfers. Finally I finished the model by adding its detail pack of brake rigging on both loco and tender, front steps and cylinder drain pipes, although it should be noted that the packing does require some trimming to allow the model to fit back in once these items have been fitted. I hope the owner will be pleased with his S15, now 30847, and if readers are able to support the Maunsell Locomotive Society in anyway, I am sure you will be more than welcome. With a break from real work planned over the Christmas period I hope to be able complete a number of outstanding projects so watch this space for further ‘Workbench Witterings’.